Picky eaters will meet their match when you put my chicken parmigiana in front of them! It's saucy, cheesy and crunchy and the flavor will blow you away. I hope you enjoy. Butterfly chicken into two thinner chicken breast. 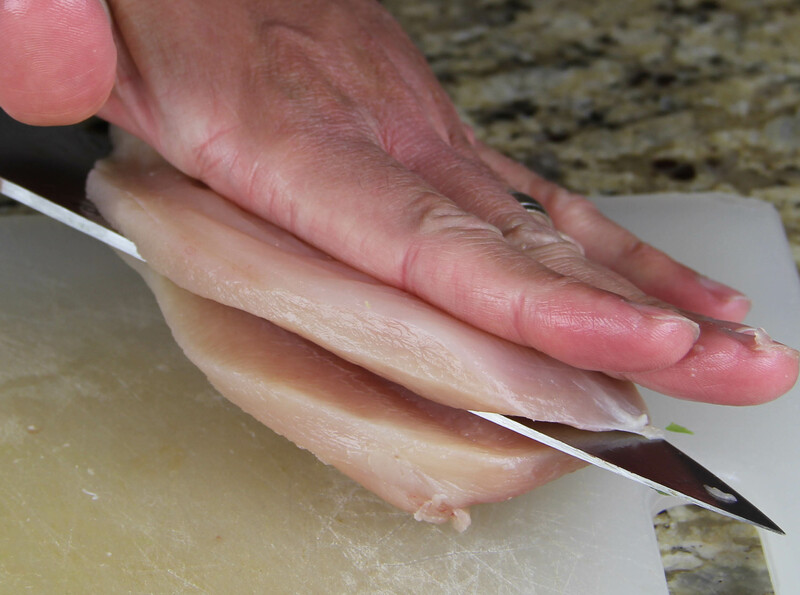 To do this, lay the chicken breast on your cutting board and place your hand on top. Take your knife and from the thicker end, cut the chicken as seen in the picture above. This helps the chicken cook faster and you'll get a better crust to chicken ratio, for a better crunch. I also like do this because you can get more pieces of parm. Like for my family, 2 chicken breasts turns into 4 servings. Now set up your breading station. Mix the flour and 1 teaspoon of salt in one bowl, your eggs and milk and a second bowl, and the breadcrumbs, oregano, pepper, basil, onion powder and garlic salt in a third bowl. Make sure the ingredients are mixed in each bowl. Take the chicken and press into the flour mixture and shake off the excess. Dunk into the egg mixture and allow the excess to drip off. Press the chicken into the bread crumbs so all the crevasses are filled with bread crumbs. Place on a plate, and finish the rest of the breasts. Put the plate in the fridge for an hour. This step is optional, but I think it's an important step to keep the crust from falling off, it's like letting cement set, you want to make sure all the ingredients meld together. To cook, Add the olive oil and butter to a pan over medium heat. Once the oil and butter are heated (couple minutes) add the chicken. Cook until the bottom is golden brown, about 6 minutes. Flip and cook on the other side for another 6 minutes. If your pan is not oven safe, remove the chicken breast to a baking sheet. Add a large tablespoon of sauce to each chicken breast. I don't smother the chicken in sauce, because I think it really destroys the crunch. Cover each breast with mozzarella. Put into the oven for another 8 minutes to melt the cheese. That's it! Take the parm out of the oven and plate next to spaghetti. I say next to because I think working to get the crust is wasted by putting the chicken on top of spaghetti, it makes the crust soggy. Also, I said not to drown the chicken in sauce, that's because I love to dunk it in sauce. I love marinara, so I serve my parm with a ramekin of sauce on the side. You can dunk each piece of the crispy chicken in the extra sauce for a perfect crunchy, cheesy, saucy bite. Enjoy!